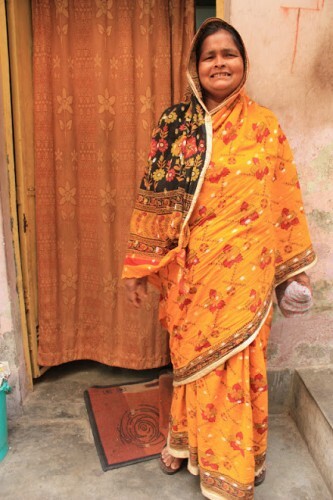 Bahiran Bibi, 48, began working as a waste picker when she was 13 years old. She lives in New Delhi, India with her family. Her parents, once farmers in West Bengal, immigrated to the capital in the 1970s. In 2003, Chintan began organizing in the part of Delhi where Bahiran lives. That’s when Bahiran became involved. Today she is president of All India Kabadi Mazdoor Mahasangh (AIKMM), a membership-based organization of waste pickers. In Bahiran’s community, more than half of the residents work as waste pickers. She remembers when life was more difficult there. It was common for police to harass the waste pickers, she said. Today, if there are problems, organizers and cooperative members will talk to the police or write letters. But the community is still struggling, she said. Waste pickers lack identification or other official documents. Another problem is the privatization of waste and recycling. In the past year, a private company has begun doing door-to-door collection, pushing the waste pickers out. “Door-to-door collection should not be done by a private company,” Bahiran said. Bahiran spent two days traveling by train to attend the First Global Strategic Workshop of Waste Pickers in Pune, India. Bahiran’s son, inspired by his mother’s leadership, is interested in organizing women waste pickers in the community and helping start an all women’s cooperative.